Reason for Stay: Chronic Obstructive Pulmonary Disease (COPD), Hematoma to abdomen and Pneumonia. Douglas Schryver arrived to our community with a hematoma in his abdomen and was unable to sit upright without feeling extreme pain. He labeled his pain a 10 out of 10 and had not been able to stand or walk. With numerous attempts to sit upright at edge of bed, Douglas could only tolerate less than a minute of sitting and unable to maintain correct posture. As his therapy sessions went on, he began showing major improvements and was able to walk 60 feet without rest. 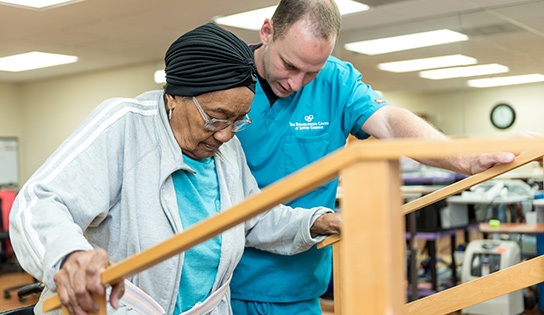 Douglas was a wonderful resident during his time at Jupiter Rehabilitation and Healthcare Center. His bubbly personality was beloved by everyone he came in contact with, from fellow residents and their families, to all of our staff. Doug loved to socialize, watch movies, keep up with politics, current events, shopping on Amazon, as well as sharing his reviews. Doug offered that he was very pleased with his stay at our community and filled out several “Ray of Sunshine” cards to inform the community about how pleased he was with the care being provided. He shared that his living quarters were clean and accessible for his needs. Doug truly enjoyed working with the therapy team, also sharing that he always looked forward to seeing which therapist he was going to work with each day. Douglas thanked the whole Jupiter team from nursing, social services, nutrition, and physical therapy. He is so happy with how far he has come since being admitted to our community. Being able to walk around and care for himself was his initial goal, and we are so glad he was able to achieve that goal! Douglas is pleased to return home where he lives with his roommate, and stated his first thing to do is to plan a dinner party for all his friends! Douglas is a local in the community and promised to stop in to visit the team once he’s settled in. Doug was given a worm goodbye from staff and sent off with well wishes. We can’t wait to see him again!